David Horowitz’s Progressive Racism exposes them, and names them. Throughout Progressive Racism, Horowitz dissects the mind of the left and lays it bare for all to see. He reminds us that while “few people outside the halls of academia may think of themselves as Marxists” or pursuers of socialist utopias, “the old socialist left is alive and powerful”—though camouflaged “behind protective labels like ‘populist,’ ‘progressive’ and even ‘liberal’.” He explains that the “contemporary leftist faith” is, like Marxism, centered around the belief that “oppressive ‘alien powers’ (as Marx referred to them)” are the corrupt and illegitimate rulers of any non-socialist society. This accounts for the left’s obsessive and relentless need to portray America as a battleground where noble, morally pure victims must constantly defend themselves against the depredations of a greedy, power-hungry “trinity of oppressors: a class-race-and-gender caste.” And Horowitz warns us that for the left, the promotion of this worldview is not merely a topic for polite conversation or spirited debate. Rather, it is all-out war—“class war”—where society’s “victim” groups are assured that a utopian “world without chains” awaits them at the end of the battle. Horowitz, who understands the mind of the left as well as anyone alive, explains that the left’s professed desire to “level the playing field” is simply a devious effort to present the ideal of “Marx’s classless society” in “politically palatable terms”; that for the left, “real” equality means not equal opportunity or equal treatment before the law, but rather, “equality of results—which is the communist ideal.” In this model, says Horowitz, inequalities in any sphere of life—income, school grades, standardized test scores, college graduation rates, incarceration rates, unemployment rates, etc.—are condemned as prima facie evidence of “the persistence of covert prejudice” or “institutional racism,” which is “the contemporary left’s version of Marx’s alien power.” And of course, the left’s response to these inequalities is always the same: to mandate an ever-growing array of race-based double standards designed to offset—under benign labels like “affirmative action” and “social justice”—the unfairness that supposedly creates inequality in all its forms. But as history has shown us not only in the U.S. but around the world, such double standards serve only to transform molehills of injustice and grievance into mighty mountains of the same. Spitting in the eye of the race-grievance industry that the civil-rights movement has pathetically devolved into, Horowitz notes that “the primary reason that African-American children are poor is cultural, not institutional or racial.” “If it were racial,” he reasons, “there would be no (or only a small) black middle class, whereas the black middle class is now the majority of the black population.” Horowitz impugns the race pimps of the modern civil-rights establishment—who are foremost among today’s progressive racists—for reflexively attributing every black ill to their all-purpose bogey-man, white racism, while virtually never mentioning that “statistically speaking, a child born into a single-parent family is five times more likely to be poor than a child born into a family with two parents, regardless of race.” The very deliberate failure of progressive racists to acknowledge this hard and discomfiting fact has bred, among many African Americans, a victim mentality and a permanent sense of bitterness and disconnection from the larger culture. And the progressive racists of our day are delighted by this development, for it has enabled them to cast themselves as the aspiring saviors of society’s “victims,” and to thereby win a permanently reliable voting bloc for the Democratic Party. We’ve all heard the venomous tirades of grievance mongers like Farrakhan, Sharpton, Jackson, Mfume, and Bond. And we’ve all heard the stern lectures of buffoonish, self-congratulating white progressives who dutifully remind us of the racism that allegedly sits at the very heart of our national character. But we’ve heard precious little about the quiet dignity of Oseola McCarty and others like her. 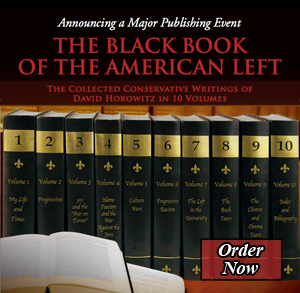 In Progressive Racism, David Horowitz explains exactly who America’s real racists are.